In other news, I have a little project to be doing. This little beastie is C2 or dicarbon, a small carbon cluster. It’s also a dicarbene, because both of those carbon atoms only have 6 valence electrons. It’s a highly reactive little compound that forms in flames transiently, before recombining into larger, more stable carbon compounds. It’s a key component in combustion chemistry, as well as being very important in circumstellar carbon chemistry. C2 is detected through the light it emits and absorbs (known as ‘Swan Bands’ after the first person to study them). It’s actually the same thing that gives gas flames (gas hobs, bunsen burners, etc) their blue colour. 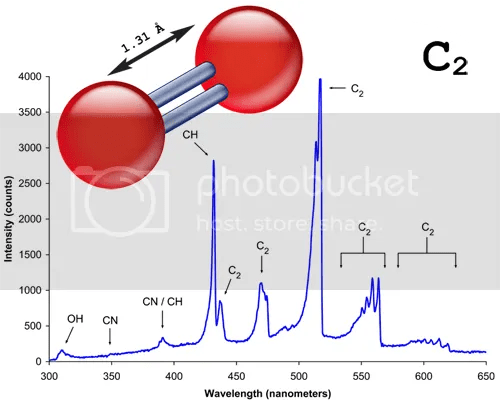 Whenever a flame starts to burn down and you see a blue colour, that’s C2. This compound is found in interstellar space, notably being emitted from comets and the atmospheres of certain stars. This entry was posted in Imported from Livejournal and tagged astrochemistry, spectroscopy. Bookmark the permalink.